Rare blueback nuatical chart of Taiwan or Formosa. The utmost care is requisite when navigating the seas comprised within the limits of this chart because they are very imperfectly known and it is believed that sunken reefs exist while have yet to be inserted on the chart, and the many of the known reefs are inaccurately placed in position. 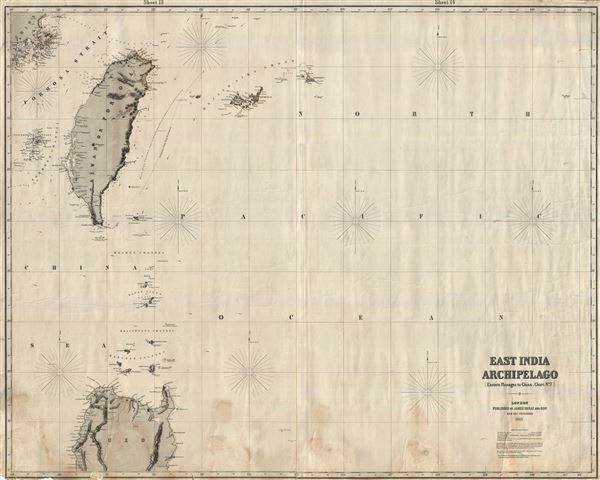 Despite the general paucity of information available, this chart represents one of the best mappings of the Taiwan region to appear in the 19th century. This region was not fully surveyed until the Japanese conquest of Taiwan in the late 19th and early 20th centuries. Good condition. Minor soiling and buckling. Some very so reinforcement. Wear and waterstains to lower quadrants. Distinctive blue backing. Would benefit from professional cleaning and rebacking on heavy linen.